The Duke and Duchess of Cambridge with their children Prince George, Princess Charlotte and Prince Louis after Prince Louis's christening at St. James's Palace, London, Britain, July 9, 2018. A lot of people have wondered how Kate Middleton stays so slim (and looks so impossibly radiant and put-together ... seriously, don't make us re-visit her four-inch hospital heels) after growing and birthing three — THREE!! — babies. Like any mom, the Duchess of Cambridge probably doesn't appreciate the inevitable attention on her post-baby body. In the past, people have speculated about her fitness routine, her diet, her genetics, and either criticized her for looking too good or applauded her for "looking as if she had never had a baby!" at all. But now the "secret" to her post-baby physique has been revealed, and it's something other moms can 100 per cent get behind. "I am running after my kids," Middleton reportedly said (tersely, we hope) in response to a question about how she lost her baby weight so quickly. And, just like that, the duchess is every mom chasing after a toddler who's sprinting gleefully toward an electrical socket, running after a pantless pre-schooler while late for school drop-off, and eating their baby's leftover Mum-Mums for dinner. Catherine, Duchess of Cambridge, chasing after Prince George and Princess Charlotte during the Maserati Royal Charity Polo Trophy at Beaufort Park on June 10, 2018 (less than two months after giving birth to Prince Louis) in Gloucester, England. According to a report this week in Hello, the duchess was responding to a question from a guest at a garden party she was attending in New Delhi, India, in 2016. At that point, she was a mother of two. And Middleton hasn't slowed down since giving birth to Prince Louis in April. 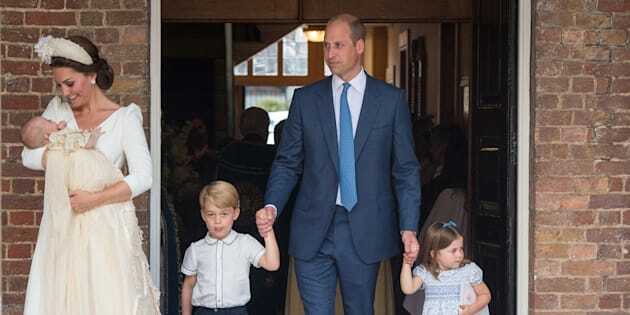 She reportedly dropped her eldest son, Prince George, off at school the day after she gave birth. A few weeks later, she wrangled George and Princess Charlotte at Prince Harry and Meghan Markle's wedding. And in June, the duchess frolicked with her two eldest at Prince William's charity polo match. At the polo match, she was seen running after her kids (ah ha!) in an attempt to tire them out before the car ride home, according to People. (#MomHack). "She seemed to say to [George, 4, and Charlotte, 3], 'First to the polo field is the winner!'" an observer told People. Catherine, Duchess of Cambridge, plays with Prince George and Princess Charlotte while attending the Maserati Royal Charity Polo Trophy at the Beaufort Polo Club on June 10, 2018 in Gloucester, England. The duchess relishes opportunities to play outside with her children, she said in an open letter to support Children's Hospice Week in May. The pressure to "bounce back" after giving birth is getting more and more attention, with celebrities such as Blake Lively and Chrissy Teigen speaking out about the unrealistic expectations placed on women after they have babies. "Should I post the one where his head looks unsupported but my face looks good and Luna is over it, the one where his head is supported but my face is just okay and Luna is over it, or him crying and my face looks okay and luna is over it?" In 2016, Teigen made sure to remind new moms that celebrities who seem to shed the pounds actually have a lot of help. "Anyone in the public eye, we have all the help we could ever need to be able to shed everything," Teigen told Today. "So I think people get this jaded sensation that everybody's losing it so quickly, but we just happen to be the ones who are out there. We have nutritionists, we have dietitians, we have trainers, we have our own schedules, we have nannies. We have people who make it possible for us to get back into shape. But nobody should feel like that's normal, or like that's realistic."